Get an uncompromised gaming experience with these high-performance products, all designed to change the game and fuel your win. Keyboard with iconic Alienware aesthetics, 15 programmable marco key functions, mechanical switch keys and a zone-based RGB backlight with AlienFXTM technology. Bring the iconic Alienware design to your gaming mouse - engineered for superior performance and comfort to get you deeper in the game. The Alienware Extra Large Gaming Mouse Mat allows for extra space when you need it most. Designed with enough space for both your keyboard and mouse. Whether it's for gaming at home or on the road, the Alienware Extra Large Gaming Mouse Pad has you covered. High-powered processing: 2nd generation AMD Ryzen™ desktop processors deliver groundbreaking machine intelligence, split-second responsiveness and powerful multitasking capabilities for exceptional gaming experiences. Ready for VR: Select configurations are available with Radeon graphics that are ready for VR with options up to RX580 allow faster, smoother gameplay, and are designed to help you dominate DirectX 12 gaming and virtual reality landscapes. And with dual graphics support, you can double down on power and speed for the ultimate gaming performance, and any other graphic-heavy tasks. Do more with more memory: With up to 32GB DDR4 RAM, this gaming desktop is loaded with memory to ensure overall super-powered performance and intensive multitasking. Better boot time: Dual-drive storage options include a high-capacity hard drive with up to 1TB HDD, and a responsive solid-state drive with up to 512GB for faster boot and load times so you can get into the game quicker. Distinct, deliberate design: From its unique chassis, to its optimal airflow and fan placement for cooling the internal components, the Inspiron Gaming Desktop is purposefully designed for uncompromised, uninterrupted gaming performance. Includes interior LED lighting for an even more gripping gaming experience. Dynamic audio: Surround yourself with high-performance 7.1 Channel HD audio for immersive, room-filling sound. Lightning-quick connection: Transfer files, and connect and power devices with blazing-fast speed thanks to an optional USB 3.1 Type-C connector that supports newer, next-gen devices and up to six easily accessible SuperSpeed USB 3.1 Gen 1 Type-A ports. Maximize your gaming capacity: Five storage bays offer plenty of room for expansion, including up to three hard-disk drives, up to two solid-state drives and up to two PCIe x16 slots for graphics upgrades. 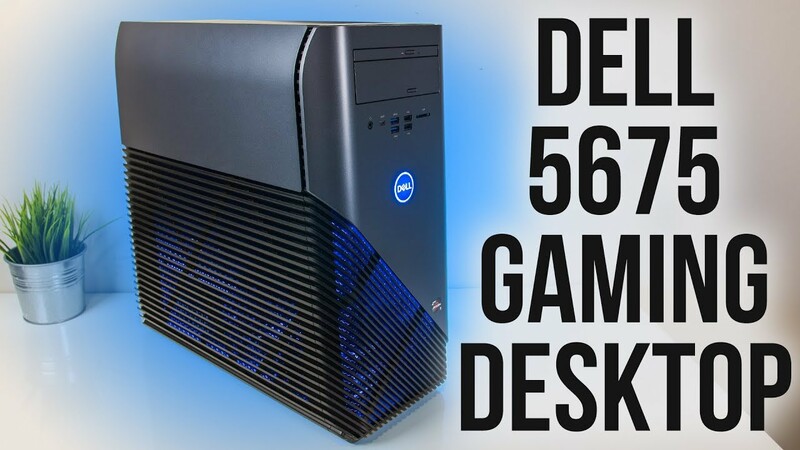 Complete your Inspiron Gaming Desktop with Dell-recommended gaming accessories. Enjoy unrivaled gameplay in a 25” monitor with the Alienware iconic design featuring a 240Hz refresh rate, 1ms response time, and AMD FreeSync™ technology for an effortlessly smooth and responsive gaming. Improve your gaming ability with a mechanical gaming keyboard with AlienFX™ lighting, five programmable macro keys, and iconic Alienware design. Experience great gaming with an all-purpose Gaming Mouse with AlienFX™ lighting (RGB) featuring 5000 DPI, 9 programmable buttons, and iconic Alienware design. Amplify every explosion with two circular satellite speakers and a powerfully compact subwoofer for enhanced bass. With convenient volume controls and a headphone jack. Experience 360-degree immersion with DTS Headphone:X 7.1 surround sound and strategize with your squad on the integrated omnidirectional microphone. Personalized lighting is a plus.